With a non persistent connection the broker doesn’t store any subscription information or undelivered messages for the client. This mode is ideal when the client only publishes messages. It can also connect as a durable client using a persistent connection. In this mode the broker will store subscription information, and undelivered messages for the client. In order for the broker to store session information for a client a client id must be used. Note: Messages that have been delivered to the client are deleted from the broker. They are not stored like email messages are stored. When a client connects to broker it uses a flag (clean_session flag) to indicate whether or not a persistent connection is required. However it is important to realise that not all messages will be stored for delivery, as the quality of service, of the subscriber and publisher has an effect. In this example we look at the effects of the clean_session flag and of the quality of service settings on message delivery. I recommend you read this article, and this article before you start as it give you more background on persistent connections. In this Example I will be using a Python script that creates two client connections. One connection subscribes to a topic and the other connection publishes on that topic. The objective is to see what happens to published messages when a subscriber is disconnected for any reason ,and how the clean_session flag, and QOS settings affect message delivery. Publish to the topic that the client subscribed to with QOS set. Expected result- No messages received as the broker shouldn’t store them. Actual Result -No messages received when reconnected as the broker didn’t store them. Expected result- Messages to be received. Comment– It is important to realise that not only do we need to set the clean_session flag to False, but we also need to publish and subscribe with a QOS of 1 or above. However the subscription information is remembered by the broker, and so the client doesn’t need to subscribe again. Expected result- No messages received when reconnected..
Actual Result -No messages received when reconnected as the clean_session flag was true. Expected result- Messages to be received when reconnected. Comment-Clean session flag is false and QOS on publish and subscribe are greater than 0. 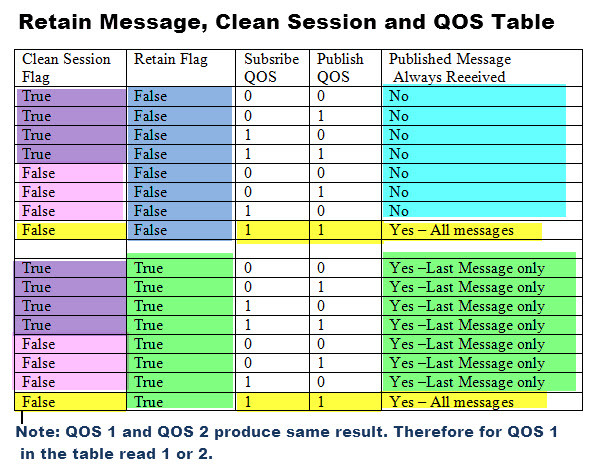 The table below is a summary showing how QOS, cleaned,session flag, and retained message flag affects what messages are received. Q- How many messages will the broker store? Q- How do I reset the client connection to be non-Persistent? Although MQTT doesn’t store messages in the same fashion as services like email, it does, in certain circumstances, store them. Whether or not they are stored depends on the QOS of both the publisher and the subscriber. However once they have been received and acknowledged by the subscriber, the broker deletes them immediately, regardless of the Clean session and QOS settings.